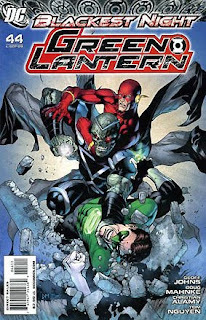 • PLOT SUMMARY: "Only the Good Die Young" - 'Blackest Night' continues! As Hal Jordan and Barry Allen investigate a bizarre crime in Gotham City, they come face to face with one of their oldest allies - J'onn J'onzz, the Martian Manhunter! But their old friend is not there for reunions; he's come for much more. Meanwhile, Sinestro seeks to rebuild his army and take his revenge on the being who would usurp it - Mongul! Written by Geoff Johns. Cover by Doug Mahnke & Christian Alamy. Pencils by Doug Mahnke, inks by Christian Alamy, Mahnke, Tom Nguyen & Rodney Ramos.